This year I'm keeping track of lots of details in my garden and since I have lots more plants than I ever did before, I needed a better tracking system than I've had in the past. I was trying to think of what I had around the house when it hit me that we had a huge box of plastic knives left over from past birthday parties. We never put the knives out at the kid parties but I usually buy a multipack of plasticware so we always have left over knives. 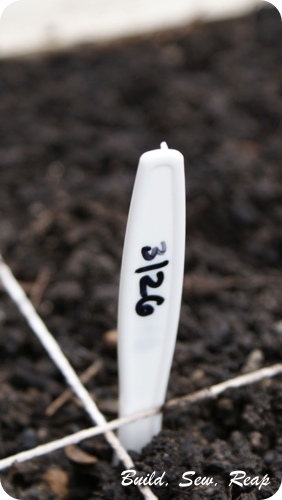 I put the date that the seeds were planted on the back side. 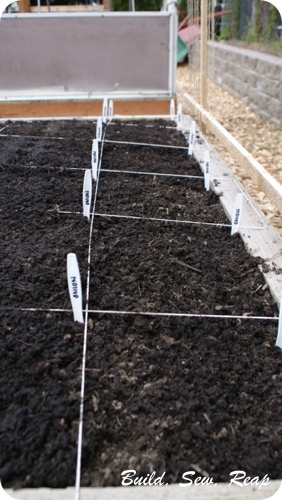 This is particularly helpful in the bed that holds the kale, spinach, carrots, bunching onions and mixed lettuce because I'm planting one square foot of each variety every few weeks so that we'll always have fresh salad goodies ready for us once they reach maturity. 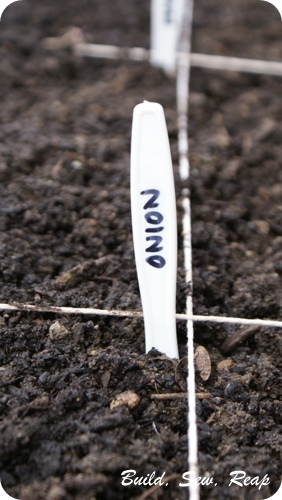 It was also helpful when I ran out of onion seeds only halfway through planting them in their spot. I am able to easily identify which square foot was planted on which date.